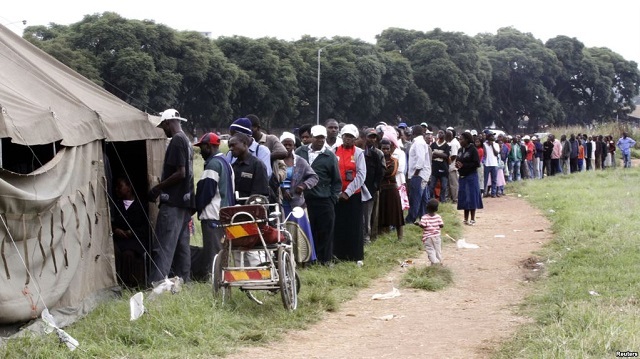 THE Zimbabwe Electoral Commission (Zec) says it will set up 10 985 polling stations countrywide for the ward-based election to be held on July 30. In a notice yesterday, Zec said Bulawayo has 428 polling stations while Harare has 1 174 polling stations. “Notice is hereby given in terms of Section 51 (3) of the Electoral Act (Chapter 2:13) that the Zimbabwe Electoral Commission has identified ten thousand nine hundred and eighty-five (10 985) polling stations where polling will take place on 30 July 2018. The polling stations for the harmonised elections shall be located at the centres specified in the schedule,” read the notice. Zec said polling shall take place on Monday July 30 from 7AM to 7PM for the purpose of electing the country’s President, members of the National Assembly and councillors for various wards in local authorities. It said it will recruit about 130 000 polling officers for this year’s harmonised elections compared to 106 000 recruited during the 2013 elections. Zec acting chief elections officer, Mr Utoile Silaigwana said the officers would be drawn from the civil service in line with the Electoral Act. “According to the Electoral Act, recruitment of polling officers is done from State institutions, local authorities and the Health Service Board. We write to them and inform them of the qualifications that we need for one to qualify to be a polling officer. That is how we select polling officers,” said Mr Silaigwana. The electoral body last week revealed that about 7 200 people had applied for postal voting in the July 30 elections.